What is the ketogenic diet? How to become a fat-burning machine? Is ketosis good for exercise? How to become keto adapted? How to measure if you are in ketosis? What are the health effects of switching from carbohydrates to fats as a primary fuel source? These questions and more answered in this week’s Biohacker’s LIVE Show. The hero of a greater journey, an anthropological student of life, a self-empowered being – those are the words Siim Land uses to describe himself. He is a writer and content creator on topics related to human performance and life enhancement. Ever since childhood, Siim’s been fascinated by human nature and the world around him, which ignited his pursuit towards understanding life as it unravels itself in your subjective experience. He’s committed himself to lifelong personal growth and the empowerment of others. Admitting that he knows nothing, Siim shares with you the most profound lessons and strategies that have changed his outlook on life. 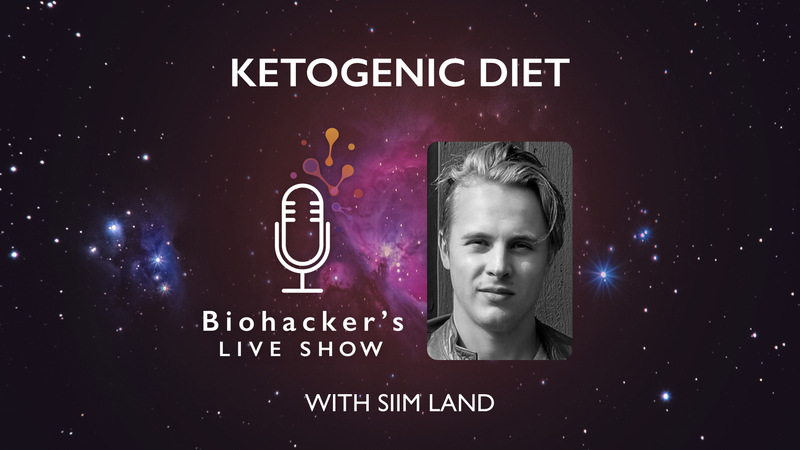 Siim Land is a regular guest at the Biohacker’s LIVE Show with his entertaining short videos that are jam-packed with ketogenic goodies. You can watch more of his videos on his Youtube channel. Anderson, J. C. (2015). Measuring breath acetone for monitoring fat loss: Review. Obesity (Silver Spring, Md. ), 23(12), 2327–2334. Endogenous acetone production is a by‐product of the fat metabolism process. Because of its small size, acetone appears in exhaled breath. Historically, endogenous acetone has been measured in exhaled breath to monitor ketosis in healthy and diabetic subjects. Recently, breath acetone concentration (BrAce) has been shown to correlate with the rate of fat loss in healthy individuals. In this review, the measurement of breath acetone in healthy subjects is evaluated for its utility in predicting fat loss and its sensitivity to changes in physiologic parameters. BrAce can range from 1 ppm in healthy non‐dieting subjects to 1,250 ppm in diabetic ketoacidosis. A strong correlation exists between increased BrAce and the rate of fat loss. Multiple metabolic and respiratory factors affect the measurement of BrAce. BrAce is most affected by changes in the following factors (in descending order): dietary macronutrient composition, caloric restriction, exercise, pulmonary factors, and other assorted factors that increase fat metabolism or inhibit acetone metabolism. Pulmonary factors affecting acetone exchange in the lung should be controlled to optimize the breath sample for measurement. When biologic factors are controlled, BrAce measurement provides a non‐invasive tool for monitoring the rate of fat loss in healthy subjects. Cohen, S., Janicki-Deverts, D., Doyle, W. J., Miller, G. E., Frank, E., Rabin, B. S., & Turner, R. B. (2012). Chronic stress, glucocorticoid receptor resistance, inflammation, and disease risk. Proceedings of the National Academy of Sciences of the United States of America, 109(16), 5995–5999. Ketonix is a reusable device that indicates ketones in your breath. This enables you to measure throughout the day with no extra costs or blood samples. By knowing your ketosis you will be able to find out how your fat-burning is affected by different lifestyle changes. 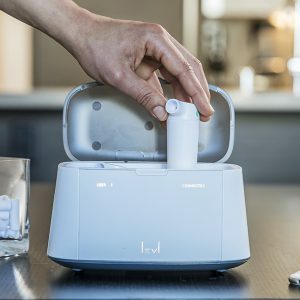 A simple breath into the LEVL breath pod gives you a 24 hour snapshot of how your wellness choices are affecting your fat metabolism and state of ketosis.